Kutshab and staff of the Permanent Mission of Bhutan in New York celebrated the 59th Birth Anniversary of His Majesty the Fourth Druk Gyalpo by hosting a dinner at the Mission. 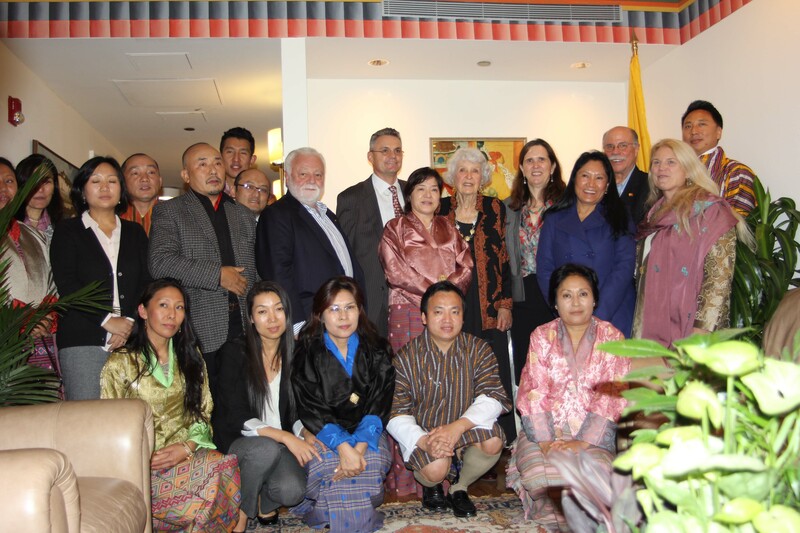 Invitees included friends of Bhutan, office bearers of the Association of Bhutanese in New York, Bhutanese working at the United Nations and staff and spouses of the Mission. The dinner started with singing of the National Anthem. In her welcome address to the gathering, Kutshab informed that the event would kick off a yearlong celebration in Bhutan to mark the 60th Birth Anniversary of His Majesty the Fourth Druk Gyalpo, which provided a landmark opportunity for the people of Bhutan to pay tribute to their beloved and deeply revered Monarch. In her address, Kutshab paid tribute to His Majesty the Fourth Druk Gyalpo, who she said had assumed the enormous responsibility of the Throne at a tender age. As the classic Warrior Philosopher King, His Majesty had ushered unprecedented peace, progress and prosperity for Bhutan during the 34 years of his glorious and legendary reign. She recalled that His Majesty the Fourth Druk Gyalpo had selflessly and personally lead the armed forces in 2003 to protect the peace and security of the country and had also carefully prepared the country for democracy before stepping down voluntarily at the peak of his popularity to pass on the reign to His Majesty King Jigme Khesar Namgyel Wangchuck. She said that the people of Bhutan were indeed most fortunate that in keeping with the tradition of the Wangchuck dynasty, His Majesty the King possessed all the qualities needed for the times. Kutshab thanked Mr. Fred Roberts, an award winning photographer with close ties to Bhutan, for presenting the mission with one of his works dedicated to His Majesty the Fourth Druk Gyalpo on this auspicious occasion. In concluding, Kutshab raised a toast for the long life and good health of His Majesty the Fourth Druk Gyalpo, His Majesty the King, Her Majesty the Gyaltsuen, Members of the Royal Family and the people of Bhutan.